You've heard of Walt Disney, the affable showman who founded The Walt Disney Company. He's an American icon. It's a shame more people don't know about him because he was the linchpin of Disney's success. It's likely that without Roy, none of Disney's achievements would have happened. Walt was imaginative, creative, and loved the spotlight. Roy was a hard-nosed operations person and preferred working in the background. Walt Disney himself once said: "My brother Roy runs this company. I just piddle around." Their company survived and thrived because it leveraged the strengths of each brother. Walt could dream up fantastic films, and elaborate theme parks. Roy had the business and financial acumen to make these dreams a reality. Walt was an artist. Roy was a numbers guy. Right now, around the world, there are millions of people trying to bring new ideas to life. But they're doing it all alone. Creatives are often solitary. We like the isolation because it allows us to focus. But ultimately, it's hard to show up every day, by yourself. When there's no one to cheer you on and no one to be accountable to, it's easier to give up. Jason Fried and DHH built Basecamp. Larry and Sergey co-founded Google. Hiten Shah and Neil Patel started Crazy Egg together. Jobs and Wozniak partnered on Apple. Ben & Jerry make ice cream together. Merlin Mann and Dan Benjamin have co-hosted their podcast for years. "Building a business is hard, don't make it harder than it needs to be!" 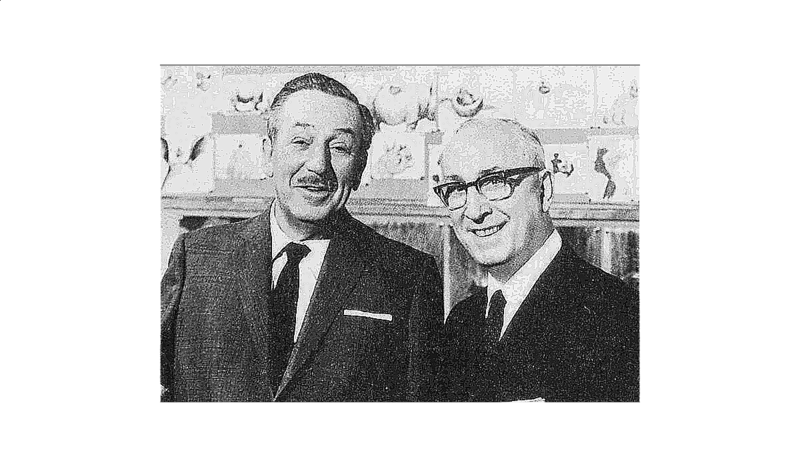 Without Roy, Walt would have never succeeded with the Disney Company. It would have been too hard to get it off the ground. Alone, it couldn't fly. In most cases, especially at the beginning, two heads are better than one. Yes, starting a partnership presents some risks. But wouldn't it be better to find a partner, and give your project a chance, rather than let it die on the vine? For years, I tried building projects on my own. But I had to limit myself because I didn't have the technical expertise to bring all my ideas to life. Then I met Jon Buda at XOXO festival. Over the years, we became friends. We collaborated on a few projects. And then, we decided to work together on Transistor (a podcast hosting and analytics platform). Jon is a gifted software developer. He has a good eye for design. My expertise is in customer research, marketing, and product development. Combined, we've been able to build Transistor into something much greater than we could have achieved on our own. You have someone who can empathize with you when you're feeling discouraged. The work is split 50/50. Instead of having to do everything myself, Jon can do what he's good at, and I can focus on what I do best. We have twice the network! So much of success in business relies on "who you know." We make better decisions. Jon is naturally cautious, while I like to make choices quickly. To move forward, we have to talk it out. This often results in better outcomes. If one of us needs to take a day off, we know that support requests will still get answered. If you've been struggling on your own, maybe it's time to find a partner! This article was originally published on March 14th, 2015. It's been updated since then.